3-color combination all-purpose pad. Make your personalized color combination. 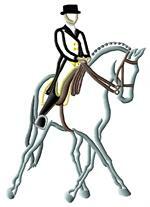 Extended-Trot, a typical Dressage pose for embroidery on vests, jackets, luggage bags, hand bags, saddle pads, saddle cover, and saddle bags. The color combination is what image shown or any color one color. 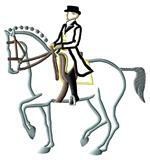 Image size is about 6" x 5"
Half-Pass is a Must pose for Dressage riders. 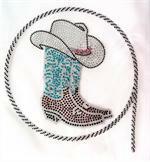 This embroidery can be on vests, jackets, luggage bags, hand bags, saddle pads, saddle cover, and saddle bags. The color combination is what image shown or any color one color. Image size is about 6" x 5"
Medium-Trot an icon pose for Dressaging. 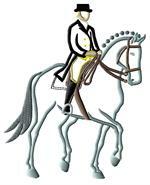 This embroidery will be great on vests, jackets, luggage bags, hand bags, saddle pads, saddle cover, and saddle bags. The color combination is what image shown or any color one color. 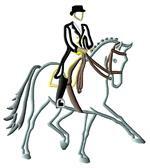 Image size is about 6" x 5"
Passage a wonderfull Dressage pose for embroidery on vests, jackets, luggage bags, hand bags, saddle pads, saddle cover, and saddle bags. The color combination is what image shown or any color one color. Image size is about 6" x 5"
Piaffe a perfect pose for embroidery on vests, jackets, luggage bags, hand bags, saddle pads, saddle cover, and saddle bags. The color combination is what image shown or any color one color. 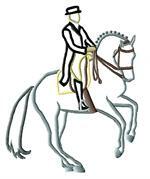 Image size is about 6" x 5"
Pirouette a Standard Dressage Pose for embroidery on vests, jackets, luggage bags, hand bags, saddle pads, saddle cover, and saddle bags. The color combination is what image shown or any color one color. Image size is about 6" x 5"